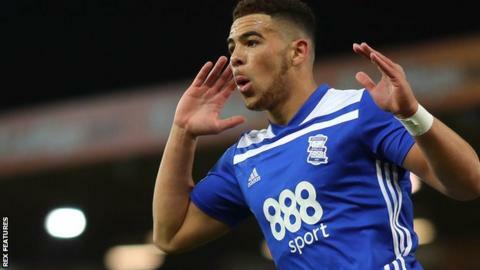 Che Adams scored his 20th and 21st Championship goals of the season as Birmingham City came back to draw against Blackburn Rovers. Blues, beaten at home by Bolton Wanderers in their previous match, went ahead through Adams' low strike before half-time. Charlie Mulgrew levelled shortly after the break when he scored direct from a corner - the third time the Rovers captain has done so this season. Danny Graham's deflected strike put Blackburn 2-1 up with eight minutes to go, but Adams equalised from a tight angle to earn a point for Garry Monk's side. Former Sheffield United striker Adams, linked with a move away from St Andrew's in January, has now scored 10 goals in his past eight league games. And his brace ensured Birmingham remain in the race for the play-offs, now six points behind sixth-placed Bristol City. Blackburn are also an outside bet to finish in the top six, but Tony Mowbray will be frustrated his team were unable to hold on having come from behind to lead. Rovers had been on a torrid run prior to Saturday's contest, losing four Championship games in a row. "Today is another lesson. I said to the players at the end, when you're dominant, an opposition should have to do something special to take the initiative back. But we handed it to them. "We stepped off for some reason, and gave them belief. That's a mistake from us, and one that cost us the three points. "It's good that you have lessons to learn. If we want to progress, we have to understand that the next time we have a team by the throat, we have to go even harder. "But credit to the players that after going 2-1 down, we still came away with the point." "The frustration in the dressing room is there to feel. You can almost cut it. The first twenty minutes was unacceptable- [there was] a fear in the team, [from] losing four games on the bounce. Nobody pressed the ball. Nobody was on the front foot. "I want to get to stage where I don't have to get off the bench and shout like an idiot at them, but it took that today to get people forward and winning balls in midfield and looking like they could hurt the opposition. "I thought for the last twenty minutes of the first half we did that, and we put them on the back foot."